In July, Disney carried out a survey of 2,000 parents in the UK, and found that 75% let their kids use their smartphones, mostly to play games, which no doubt keeps them entertained for hours upon hours! You may be a little wary about letting your kids play with your precious smartphone, but this isn’t just about playing games, there are hundreds of useful apps which can help make learning fun, like reading, writing, and music apps! This app is just as good for parents, as well as children. 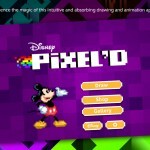 You can choose from a variety of Disney’s most famous characters and create your own pixel-art drawings and animations, which can then be shared easily online. This animation app allows your kids to appeal to their more creative side, and use their imagination to create scenes. I love this app, especially because you can hear each pixel ‘pop’ as you create your picture, and see your images come to life with an easy frame-by-frame animation. I also love how you can share the end result via social networks, perfect for sending Daddy your kids photos whilst he’s at work. This is the perfect app to teach your kids how to play the piano. The app is a virtual piano that warps into magical shapes. It will teach older kids how to play a variety of songs, from pop hits to classics. This educational numbers app gets your child to count by placing fingers on the iPad’s touch screen, with cute cartoon numbers appearing, depending on how many fingers are pressed, and also incorporates simple maths tasks. The app is suitable for children between 3 – 7 years old. This app is great for kids to learn about the clock. Lots of kids have trouble with learning the clock, so the collection of 24 mini-games, one for each hour of the day, from tooth-brushing to pancake making is ideal for familiarising children with the clock. This app is purely for entertainment purposes, and my kids are obsessed with it! Your kids act as a train driver in this train drive simulator, chugging its way through a cartoon 3D landscape, picking up passengers and cargo. It’s open-ended, which means children can create their own stories for the characters. Do you have any apps that your kids love?